Never has this statement been more accurate than today, equine health is suffering. Equine cancer is on the rise, Cushings and IR are rampant, and skin issues are at an all time high. What if I told you, there is no magic bullet, there is no secret to good health except for one thing… good nutrition. With this book you will take control of your horse’s diet and grow your very own equine superfoods, these superfoods will go toward strengthening the defense system of your horse. Feeding your horse whole foods that you are in control of this book provides a full A-Z sprouting guide with full nutritional breakdown. All the information you need to get started on the road to excellent equine nutrition can be found in this book. Theses sprouted foods are 100% natural and full of vital enzymes for digestion, full of antioxidants for fighting disease, recovery and radiance. Sprouted foods provide the most bioavailable organic minerals these natural compounds are easily used by the body and will replenish & rejuvenate. 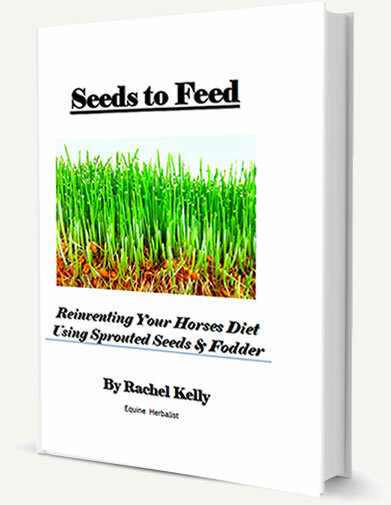 Sprouting seeds for your horses is a very simple process this book will provide you with step by step guidelines on what to sprout and why and what not to sprout. Fill in your email address - we need this so we know where to send the book! !